Book a call back | Rated 97% on GoOverseas! Non-native? We’ve got your back! Korea Job Placement – New! 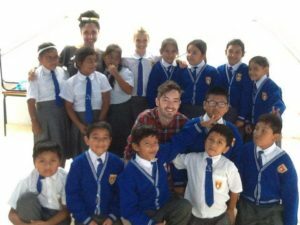 When beginning to write this article about my experiences teaching in Peru the first thing that came to my mind was the word “wow” because how could I ever put this heartwarming experience into words? It was more than fantastic. 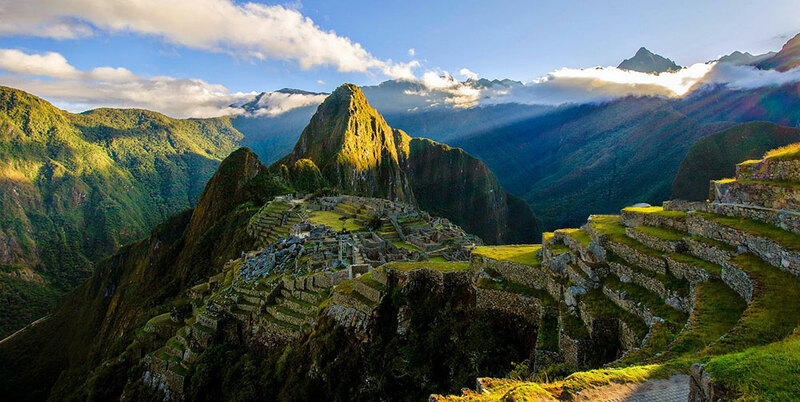 Let me put it this way… I would go as far as saying it was one of the best experiences I had in South America, up there with visiting the infamous landmark of Machu Picchu and working on the Galapagos Islands! Yes really… it was that good. During our travels throughout South America my boyfriend and I were determined to have an experience where we were able to immerse ourselves into the amazing cultures the continent has to offer. We therefore decided beforehand that we would pick up work as we trekked through. 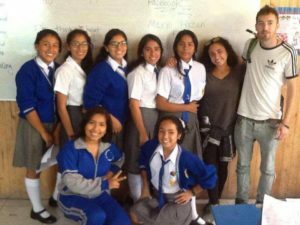 In Peru, we came across a posting to teach at a school in a small beach town called Punta Negra, about 60 km outside the big city of Lima. We applied on a whim, got offered the position, and decided to go for it as nothing beats an off the path endeavor. Never once did we look back or regret our decision. One of our dearest friends… Professor Leo! 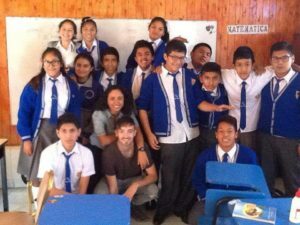 When we arrived at the school on day 1 we heard students shouting out “Gringo! Gringo!” as we walked past. Translation of this…? “White people! White people!” Of course we were thinking “oh my goodness, what have we gotten ourselves into?” But never mind that, they were just being kids and having a little laugh. In absolutely no time we came to love these students more than we could have ever imagined. They were more than just easy to teach. They were an absolute pleasure. Respectful, kind-hearted, caring, and quite funny for that matter! As a teacher the times in your life are few and far between when you can go up to the whiteboard and have an entire classroom of 30 students be absolutely silent, hanging onto your every word. That’s what most of our moments felt like at this school. We came to love these students so much that we even went back to visit and teach again later on. The head English teacher whom we worked alongside with became one of our closest friends. All of the teachers were warm and friendly, welcoming us with open arms. The headmaster seemed as if he couldn’t be happier or more appreciative that we were becoming a part of his school. We even got invited to one of our students’ houses for lunch and through language barriers enjoyed a home cooked meal and some fun with his family. Needless to say, we felt accepted and loved each and every day that we walked through those doors. A lot of people say that having one of these certificates is just for the piece of paper, but I would have to say that I highly disagree. 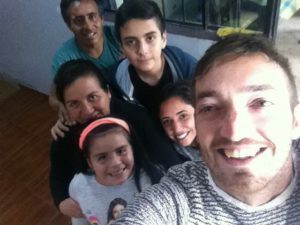 I found it so useful to have gone through a TEFL training for a few reasons. There were times when Professor Leo asked us to take over without warning to teach students in a dynamic manner. This usually involved either speaking or listening skills veering away from the usual grammar and reading skills they practice. I thrived for these moments! And that’s because I already had some ideas in my head having gone through a TEFL training. The students also crave a different kind of learning then what their regular teachers give them, and you will learn these skills in some sort of ESL course. For most English Teacher positions, this is the reason you’re hired. I also knew how to manage a class and the different styles that would engage each age group of students. The English of the students was limited. 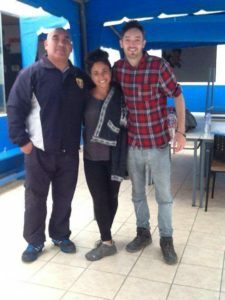 Therefore, it was extremely useful to have gone through TEFL training for some techniques on how to teach students with a variety of abilities. Unlike what many blog posts may tell you, the purpose of teaching English to students is NOT to speak their language, even if you are fluent in it! They already have their main teachers for that. It’s hard to avoid falling into this trap, but an ESL course will teach you how to hold your ground and use solely English and body language to communicate with low frustration levels. A lot of what the students learn in Peru deals with grammatical forms. Do you remember studying grammar in school? I sure don’t. It was great to brush up on it during my TEFL course so that I was able to explain things to students in a simple matter. As you can see from the pictures provided we were required to work with all students at the school, ages 6-17. You never know what kind of job you are going to land, and if you are pressed for time or money you can’t always be picky! During an ESL course different teaching styles and classroom management techniques are learned and can be applied to students of all ages when put it into practice. Start your own life of teaching and travel by getting TEFL certified. Click to learn about our online certification course and free job placement support. Marni Hazan is originally from the United States of America, born and raised in New York. Always dreaming of becoming a teacher, upon graduation from University she embarked on a journey abroad that has led her to teach in four different continents, immersing into the cultures that each country has to offer. She loves what she does and sharing her wisdom while learning about the experiences of others. Marni doesn’t have a blog, but she often provides support and guidance to those in their transition into moving abroad through her email address at marni.hazan.travels24@gmail.com. 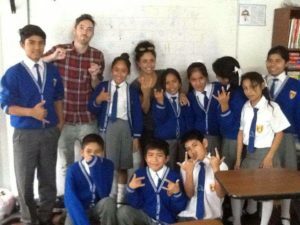 At Let’s TEFL our mission is to make it fast, easy, and stress-free to join a life of teaching. We provide everything needed to get started on your journey of a lifetime – in one single course!